Paradise Found - maker's of fine Hawaiian clothing for over 50 years. The Ladies Hawaiian Shirt does not have a breast pocket or a back yoke as the Men's Aloha Shirt. 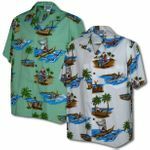 The Ladies Hawaiian Shirt has removable shoulder pads, 3" side bottom slits with buttons sewn on the opposite side as the Men's shirt. There are no universal size standards in the apparel business. One manufacturer’s large is another manufacturer’s medium, etc. These measurements, shown in inches, on this size chart, pertain to Women's Paradise Found Shirts, and have no relationship to any other shirt maker or brand name. BUST or CHEST measurement is the circumference measurement taken from just below the armpits from seam to seam. The measuement is taken with the shirt flat on a table. The measurements shown above are SHIRT measurements and NOT body measurements. All Men's R. J. Clancy shirts have genuine Coconut Shell Buttons.